Please note: we are not the owners of the lighthouse and cannot approve or recommend television shows for projects at the lighthouse. As a state owned facility, the lighthouse is subject to the rules and restrictions involved with filming on state properties. And from our perspective, too much advertising that focuses on only the paranormal can lead to additional problems with vandalism by those who expect something to happen the instant they enter the grounds. The lighthouse is often referred to as the most haunted in America, but who gave this classification and why? Sensationalism sells. The place is steeped in history, paranormal and otherwise, but really is not very scary at all. Thank you for your understanding. 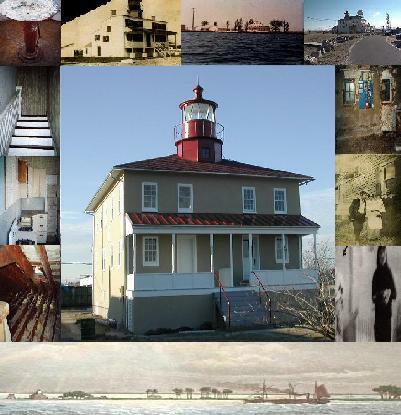 The lighthouse is open on select days to the public, please visit: http://www.pllps.org/upcomingevents.shtml for the complete schedule. Check out the preservation society's Facebook page by clicking the link below. Special thanks to Kim Hammond for creating and maintaining this wonderful source of information about the lighthouse and events.